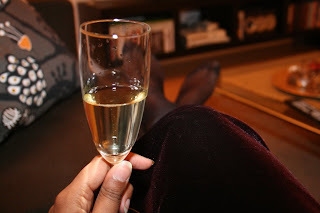 Don't forget to head on over to martawrites for the giveaway tomorrow! I had some of that beautiful blue mixed ink leftover so I decided to print a bag for the etsy shop. 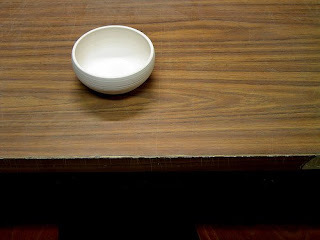 Wabi-Sabi is the Japanese art of finding beauty in imperfection. In our everyday lives, isn't this really what it's all about? I think so. 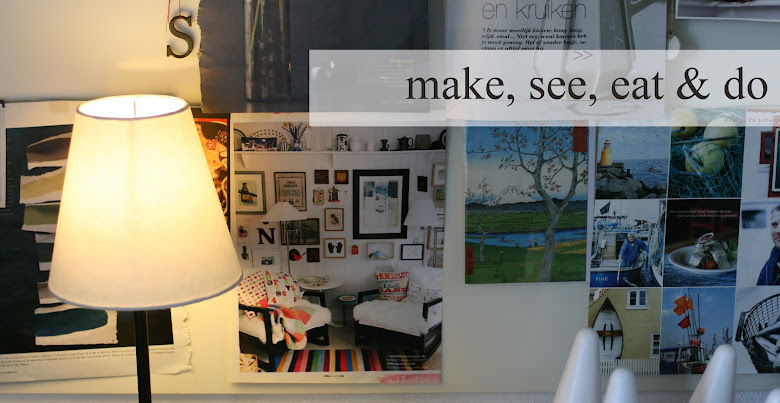 Keeping your eyes open for hidden surprises, seeing the beauty in a chipped plate, a scratched table, a faded book. 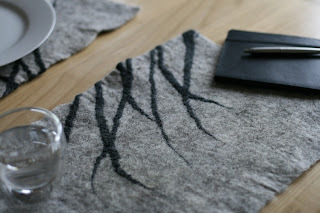 My inspiration for these placemats came from this way of thinking, and from Japanese sumi-e ink paintings. Simple strokes which evoke a feeling. 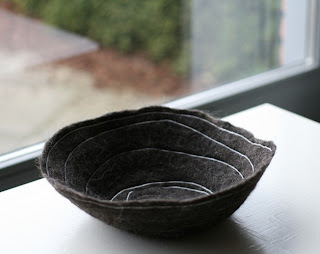 My strokes here are in the form of wispy black merino, laid and felted to resemble branches. I have a few more mental sketches which I'd like to try using this placemat medium. It's like a canvas of sorts, and laying out the wool strands almost echoes painting. 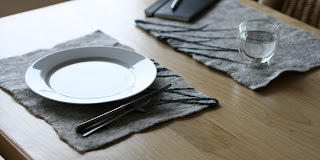 ** The lovely Marta of martawrites is having a giveaway this Thursday featuring my ekster apron. Leave a comment for a chance to win! Not much to say, just pictures to share. Monday past was my second last ceramics lesson. I had glazed three of my vessels the week before, and was quite excited to see how they had turned out. 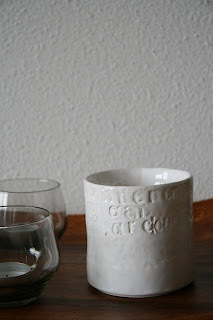 My favorite of the entire batch is a simple cylindrical vase, which might I add I threw entirely on my own. After it had dried to the leather-hard stage, lead letterpress type was used to imprint a small excerpt of text, namely two sentences from the song, 'Ahead by a Century' from The Tragically Hip. It's one of my favorites, and the one which introduced me to their music. The one that made me stop dead in my tracks, at the age of 15, in my old Canadian home, in a time when I listened to anything but that genre. The one which I still find so hauntingly beautiful, I still get goosebumps when I hear that guitar. I've got some awesome news! I was approached by the Donna Hay team to see if I was interested in making some of my felted goodies for her new general store. She'll be carrying my pebbles, big and small, come the end of this month when the store's doors open in Sydney. I know they were planning the opening at the beginning of this month - shipping in time was a bit stressed for me - but it turns out they've got some delays and are aiming for the first of April. Also, I finally got my supplies in for finishing the snowdrop project I started weeks ago. You can find it in my etsy shop. Hello! What a great feeling it is when a new project works out. I made these lovebirds last night, and was so inspired by them, I would've been happy just working into the wee hours of the morning. 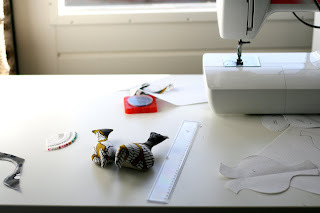 Of course, my 9 to 5 the next day would've been a headache so I painfully tore myself away from the sewing table. I started with a simple pattern and then started sketching out adjustments to create the look I had in my mind. A shorter tail, a rounder belly, a little nip here, a little tuck there. And of course, there will be felt in these little feathered friends. There's still a bit of work to do before they're exactly how I want them, but I think I'm on the right track. I think they'd be a nice addition to some new spring themed items coming in the shop soon. I wouldn't say that spring is my favorite season. It doesn't compare to the warm summer evenings, or the fiery autumn foliage, or even the frosty winter mornings in December. There is something about it though. That burst of life after months of cold and gray. I've got a couple items green-themed to herald in the spring season. A scarf, handfelted and machine stitched, which will be photographed and added to shop soon. 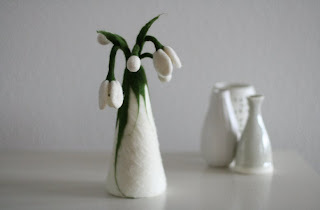 Maybe a little forest of tree folk, and something extra special to honor those little white flowers which are the first blooms to come up in the new year - snowdrops. Been doing a bit of sewing lately. 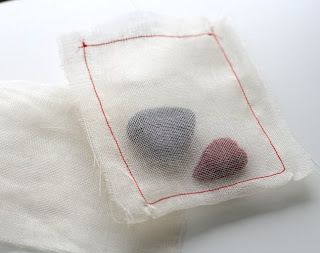 The pouches for these heart pairs for one, and a new green scarf which will be added to the shop this week. Not much to say right now, just some pictures to share. I am in love with this medium. I knew all that bottled up energy from the days (years actually!) 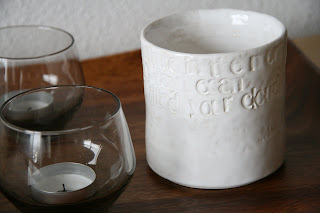 of dreaming about taking a pottery class would all come rushing out, but I had no idea! It did take a while to get the basic technique down, and I'm still learning, but it is great fun. 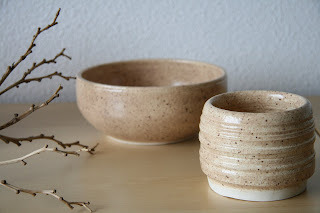 So far, I've made a few bowls and vases, with much help from my teacher. I'm at the point where I want to experiment; carving with linocutters, printing with lead lettertype, cutting out holes to thread with felted cords. Tonight I think I'll give the letterpress idea a try. 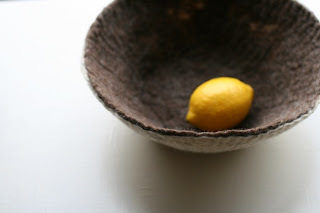 A cream handfelted bowl in the store ~ check etsy. I've been wrapping up some loose ends here lately. Two major shipments were sent out to stores last week, which involved some serious time commitment on my side, hence my very minimal posting on etsy lately. 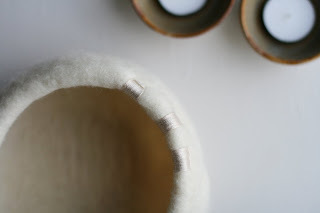 The past few days I've been slowly picking up the felting needles to work on that new project I mentioned in the last post. Some of the supplies I ordered apparently weren't in stock anymore, so I'll have to wait a couple weeks before I can start assembling. But looking on the bright side, at least I'll have enough time to get the flowers finished. I don't want to give away too much, but inspiration for the new piece stems from the tree folk I made for LOLA. 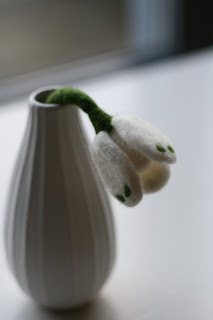 Below, the very first flower which will be going into the new spring item. I made a wee mistake in its design. Maybe I'll turn this flower into a brooch, and start anew on the other one.